This article is an explanation of Cable Management. After learning about racks, you will all want to get your head around cable management to keep your racks nice and tidy. We see this kind of thing all too often, and being aware of this issue can save IT managers from tearing their hair out one rack at a time. Cable management is not a hard concept to grasp. Its sole purpose is to consolidate, organise, and tidy cables that are routed around a data cabinet. They come in all shapes and sizes for all the various jobs that cabling is used in. The main point is that cable management is always necessary. It can make even the messiest and unplanned of jobs look professional and organised, and leaves a great impression with the end-user. We have a few pictures below of a rack from one of our branches as an example of what a difference Cable Management can make. Because there isn't a lot of technical know-how behind cable management, this article will simply raise awareness of the different kinds of Cable Management and their many uses by listing a large range below. Available as a generic, the D-Ring cable manager is the most basic of cable management. They are also (usually) the cheapest option. They consist of 4-5 'D' shaped rings mounted to a thin metal backing. The cheaper ones only allow cable management from the front and sides. The higher end ones have holes cut into the backboard to allow cabling in from the back of the rack (like in the picture on the right below). These are usually a Rack-tech/B&R solution. These are made up of many small finger-like plastic prongs that are fastened to a metal backing. 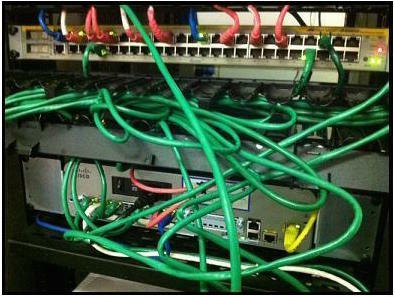 The advantage of this kind of management is the ability to fix and route cabling to exactly where you want it. Most of the time the management fingers have a small hook on the end so a cover can be attached. This hides the cable from sight and makes a clean, organised finish. 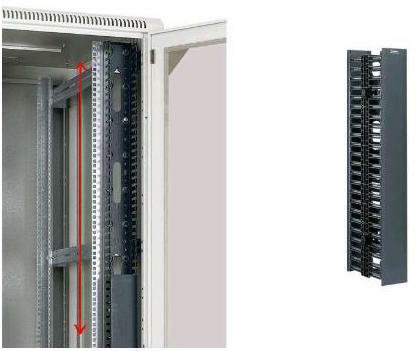 Unlike the last two options, vertical cable management is known as a "0U" solution. This means it does not take up any RU (rack units). This is because the last two options sit horizontally in the cabinet (and are mounted to the cabinet rails). The vertical cable managers mount to the left or right of the equipment mounting rails. This cable management is usually used to route cables between rack units and is handy when something at the bottom of a rack needs to be connected to something at the top of the rack. Vertical cable management usually runs from the bottom of a cabinet all the way to the top and is the same RU as the cabinet it’s going in. 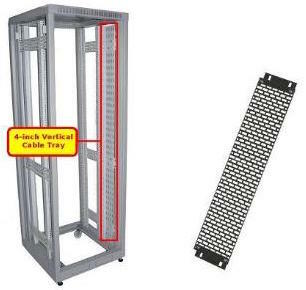 As the name suggests, it is a perforated flat tray mounted on the inside of a cabinet (similar to the vertical cable manager). The cables are usually velcro or zip tied to the tray. This is also a "0U" solution. Rear looming bars are a different beast altogether. They sit behind patch panels and take the weight of the cables that come out the back. 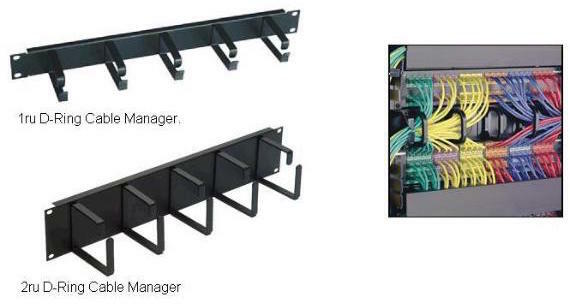 Without a rear looming bar, the weight of the copper cabling (especially when bundled in groups of 24 cables or more) can, over time, put strain on the connection on the back of patch panel. They range from a perforated panel that has a dedicated loop for each cable coming out of the patch panel to a simple bent metal bar.